Kathryn O’Shields is the documentarian for the 2010 Steampunk Haunted House and has contributed this essay to Culturebot. It began with a horrified scream. In front of us, a woman thrashed furiously in a bed, trying to wake up from a nightmare. But instead of opening her eyes, she sank into—and literally through—the middle of the bed. As soon as she disappeared, the bed flipped up vertically and the dreamer walked out of it. And we had to follow her. Suddenly, I found myself alone, in a different room. Silvery music-box chimes were playing “Beautiful Dreamer” in the darkness around me. There was a small lantern in my hand. I was in a room with a display of dolls’ heads and carnations in a case. As I passed my lantern’s light across the floor, I saw that it was littered with fabric and paper. I felt lost, disoriented. Then people began to float past me—anachronistic ghosts in a trance, whispering, humming, dancing, and struggling with each other. They sped past me as if I weren’t there, but I instinctively backed away, until I heard a close voice in my ear. “Be careful what you covet.” I gasped and turned to see a young Victorian man, who began to hum and lilt away. I then saw a few others with lanterns like mine and remembered that we could roam freely around the house. I stumbled into the theatre, where zombie-like creatures were crawling over the seats. In the stage was a hole, out of which a bluish-white light pierced upward into the haze of the room. Someone sat above it, slowly operating a pulley that fed a rope into the hole. I crept closer toward it, avoiding the man with a gas mask and bobby’s stick. Looking down inside, I saw the rope disappear into a bright light. Only later, at the end, would I see what was really there. It was the engine of the dream: the three Furies themselves, weaving the dream like the Fates with their thread. What is truly scary? There are unconscious, deep fears we all share, like darkness, being alone, irrationality, and incongruity. These are the things that haunt us in our dreams. 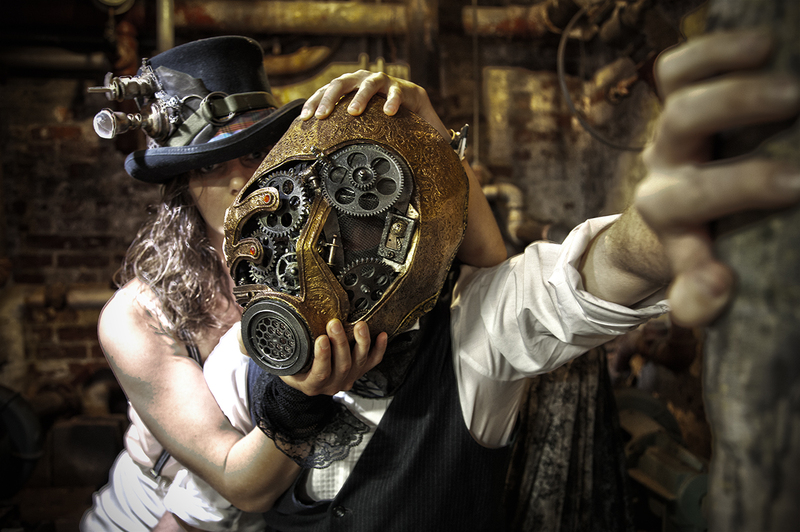 The Steampunk Haunted House harnesses the power of these primal elements. It doesn’t just cause fear; it creates it.